This is the final installment in a 5-part series on the life & ministry of Moses. This printable lesson plan is designed to teach preschool aged children about the 10 Commandments. It could be used in any setting with children age 2-5 at church, including a preschool Sunday School class or a preschool children’s church class. As always, consider your own ministry context and modify it as needed. Learning Objectives: After this lesson, the children will demonstrate an understanding of the 10 Commandments by being able to state a few of them. 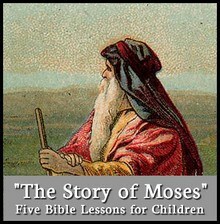 Worship: Use Moses Songs (extra print out) to lead the children to sing before the Bible lesson. You could also use the Ten Commandments song from the Go Fish Guys. Coloring the 10 Commandments – give each child a copy of the 10 Commandments’ mini book and let them color it. Make sure each child’s name gets written on their book. Cut the mini book on the dotted line and fold on the bold lines. Bible Lesson Introduction: What are some of the rules at your house? What are you allowed to do and not allowed to do? Did you know that God has rules, too? We are going to learn about them today. Read Exodus Exodus 20:1-17 (NIRV) aloud to the children. There is also a book that you can print out that has the story along with simple pictures to help the children understand what is being read. Read the verses (story) to the children. If you are using the print out story, point to the pictures as you read the story so that the children can better understand what you are saying. Read Exodus 20:1-17 (NIRV) aloud to the children. 2 “I am the Lord your God. I brought you out of Egypt. That is the land where you were slaves. 3 “Do not put any other gods in place of me. 4 “Do not make statues of gods that look like anything in the sky or on the earth or in the waters. 5 Do not bow down to them or worship them. I, the Lord your God, am a jealous God. I punish the children for the sin of their parents. I punish the grandchildren and great-grandchildren of those who hate me. 6 But for all time to come I show love to all those who love me and keep my commandments. 7 “Do not misuse the name of the Lord your God. The Lord will find guilty anyone who misuses his name. 8 “Remember to keep the Sabbath day holy. 9 Do all of your work in six days. 10 But the seventh day is a Sabbath in honor of the Lord your God. Do not do any work on that day. The same command applies to your sons and daughters, your male and female servants, and your animals. It also applies to any outsiders who live in your cities. 11 In six days I made the heavens and the earth. I made the oceans and everything in them. But I rested on the seventh day. So I blessed the Sabbath day and made it holy. 12 “Honor your father and mother. Then you will live a long time in the land the Lord your God is giving you. 13 “Do not commit murder. 16 “Do not give false witness against your neighbor. Read the story again, but this time have the children count on their fingers as you say the numbers of the commandments. When you are finished reading the story the second time, ask the children the following questions so that you can know they understood it. Play Memory with the children. You can either keep the cards facing up or face them down. Do this a few times with the children. Make it fun for them to do the motions and say the words. Involving them in active learning is essential for memorization at this age. Go through the signs again and talk about what would happen we didn’t have that rule. Evaluation:Have the children state any of the 10 Commandments that they can remember. Need More Ideas? Browse all our preschool lessons and Bible object lessons. We are doing our vbs on the 10 commandments. We are a small church with very little to spend so this is wonderful! Thank you so much!!! Tony Kummer (Editor) reviewed & updated this page on : January 18, 2011 at 7:48 pm. All our content is peer reviewed by our readers, simply leave a comment on any post suggest an update.